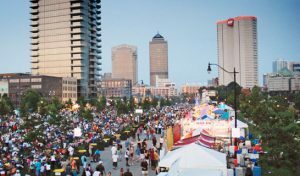 The 36th Annual Columbus Jazz and Rib Festival returns to the North Bank park area along the Scioto River downtown for a weekend of live jazz (and ribs) July 17th through July 19th. This year’s festival will offer jazz fans a plethora of live performances showcasing internationally renowned jazz artists like Eddie Palmieri, Dr. Lonnie Smith, David Sanborn, John Pizzarelli, and top local jazz talent including fo/mo/deep, James Gaiters’ Muv-ment, the Tom Davis Quartet and many more. The Jazz Café at North Bank Pavilion will showcase local and regional jazz artists on the riverfront stage set against the city skyline. The Jazz Café also features covered seating on the back patio of the North Bank Pavilion. Here is a complete schedule of live jazz performances for the weekend.